Canada officially has royal fever! Prince William and Duchess Kate left Prince George and Princess Charlotte at their palatial Canadian residence on Sunday for a day trip to Vancouver. 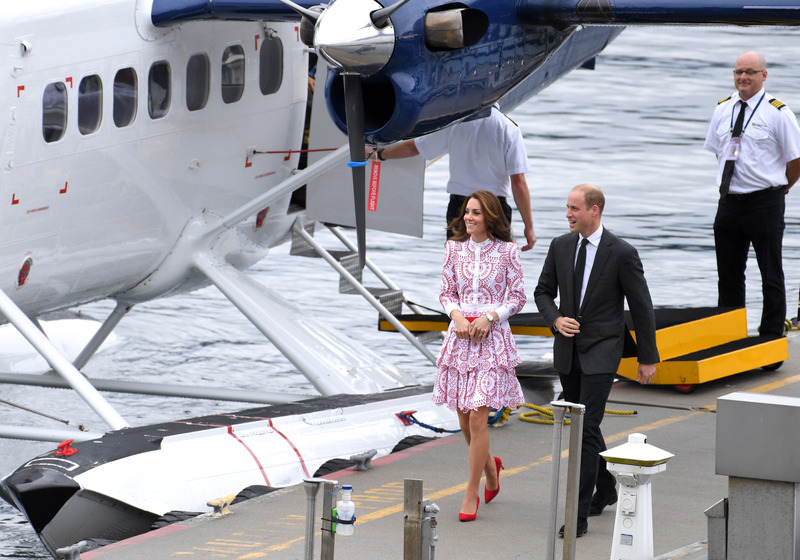 The couple was in for a treat on Sunday when they were treated to a 'float plane' ride from Victoria to the bustling city of Vancouver. William and Kate were all smiles as they waved to onlookers before taking off. Once they arrived at Jack Poole Plaza in Vancouver, a huge crowd greeted the pair with a true Canadian welcome. Of course, Duchess Kate didn't disappoint in the fashion department. In a nod to Canada, the 34-year-old stunned in a red-and-white Alexander McQueen dress that hugged her tiny figure. She paired the look with bright red pumps and a clutch of the same color. She kept with her signature look -- opting for a bombshell wave hairstyle and subtle makeup. Yesterday, the brunette beauty touched down in Victoria with a daring blue Jenny Packham dress and intricate headpiece. Thankfully, this is only Day 2 of the Cambridge family's Canadian tour -- we can't wait to see what other looks Kate has up her sleeve!